Brian offers a discount of 25% on their first / introductory lesson! Punctual, Hard-working humanities teacher who understand the stress and pressure of second level. Building confidence in the subject is the key to all studying. I am dedicated to my students to ensure they achieve their main goals. 4 years experience of teaching History, RE, English and ESL to junior and leaving certificate students regardless of aims and experience. 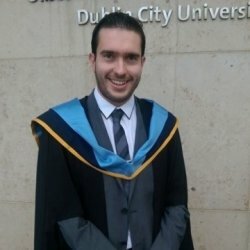 Taught in various different schools around Dublin and have worked with private language companies, ensuring students receive a quality education. Tutored students through both leaving and junior certificate subjects helping them increase grades and achieve the points they desired. I have covered a lot of project work with pupils for leaving cert written assignments and junior cert CBAs. I place a strong emphasis on understanding a topic and encourage students to avoid simply learning off essays. Instead I emphasize breaking down topics to allow a standard comprehension and interpretation of data. Create my own revision sheets with perfect synopsis of topics like document questions and poets to avoid students relying heavily on learning off chapters and phrases. BrianFrom Samuel (5/5): (Senior Cycle Religious Studies) Insightful, Professional, Conscienscious individual with profound knowledge off the subjects he is tutoring.